Face it, the tech industry is obsessed with resolution; we want every display to be high definition, regardless of size. We also want our devices to be affordable, leaving device manufactures with an interesting problem: how do they manufacture low-cost products with high-resolution screens? 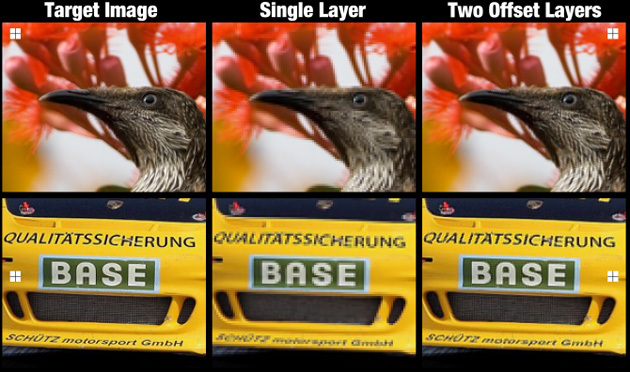 NVIDIA researchers have one solution -- stack two low-resolution panels on top of each other to increase pixel density on the cheap. The solution is so simple it sounds ridiculous, but apparently, it works. Researchers disassembled two 1,280 x 800 LCD panels and rebuilt them into a single display with slightly offset pixels, a filter to weed out polarization conflicts and a bit of customized software to force the display components to work in tandem. NVIDIA calls the resulting prototype a "cascaded display," and in tests it has quadrupled the spatial resolution of the original panels (thanks, in part, to how the pixel offset crams an additional four pixels behind every one of the first panel's visible pixel). The images produced by the cascaded display aren't quite as good as the full resolution target image, but it's leaps and bounds ahead of the capabilities of the original 1,280 x 800 panels. It's also a comparatively inexpensive way to build higher resolutions screens for head mounted displays like the Oculus Rift. These hobbled together panels aren't perfect, of course -- the cascaded display is less bright than a typical screen and apparently has poor viewing angles -- but the research could lead to a better way to build affordable, high definition electronics. Check out the video below to see the technology in action. Today, folks over at AllAboutSamsung were able to confirm hardware specifications of the Galaxy Alpha SM-G850F using AnTuTu benchmark. It is powered by an Exynos 5433 octa-core processor, Mali-T628 GPU and 2GB of RAM. This processor is supposed to be used in the upcoming Galaxy Note 4 as well. Although there’s no microSD card slot, the Galaxy Alpha comes with 32GB of internal storage space. Apart from that, it will have a 12MP primary camera with LED flash and a 2MP front-facing camera. The screenshots also confirm our previous report that it will have a 4.8 inch display with 720p resolution. The device scored exceptionally well in the benchmark as the powerful Exynos 5433 processor is able to drive the 720p screen quite easily. It has a nano SIM card slot, a fingerprint sensor and a heart rate monitor. From the looks of it, the Galaxy Alpha has a mix of high-end and mid-range features as it is supposed to be placed between the Galaxy S5 Mini and the Galaxy S5. We’ve already reported that the Galaxy Alpha SM-G850F could be unveiled on August 4th but AllAboutSamsung reports that the announcement is pushed to August 13th. Although the OnePlus One was notoriously slow to ship, Chinese startup OnePlus is moving fast indeed. After introducing its "flagship killer" earlier this year, the company is shifting gears towards its first smart-watch - predictably titled the OneWatch. A sketch and webpage screenshot leaked online, giving us an interesting glimpse at what is in no doubt going to become a beautiful timepiece. Like the Moto 360, the OneWatch boasts a circular OLED display - protected by sapphire glass, no less, and the watch face is protected by titanium borders. 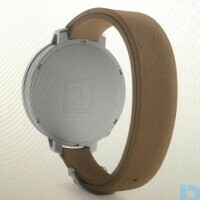 The watch has a crown to be configured, and most interestingly, it is said that its leather strap is home to a curved battery which can be wirelessly charged. The OneWatch appears to be comparatively smaller than the Moto 360 and other Android Wear gadgets, which is good news for those preferring more discrete watches. 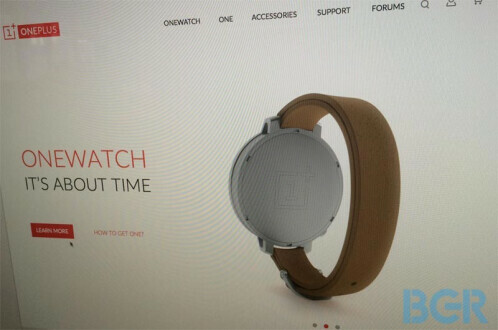 Mind you, so far nothing suggests the OneWatch is another Android Wear device. Chances are equal that OnePlus will opt either for Google's watch-centric Android build, or for a home-cooked Android ROM. Perhaps the company can also get the Cyanogen team on board. We'll see. At this point, the launch date and other details are amiss, but if the OneWatch is in advanced-enough stages, we ought to hear more about it pretty soon. Samsung Electronics will unveil its new phablet ― Galaxy Note 4 in Berlin on Sept. 3, executives at Samsung's top-tier local parts suppliers said. They said Samsung is apparently looking to rush the Galaxy Note 4 out the door to try and combat Apple's new iPhone ― "iPhone 6" ― which is due out the same month. "Samsung will hold an event to announce the Note 4 on Sept. 3, just few days before this year's IFA trade fair in Berlin, Germany ― Europe's biggest technology exhibition," said an executive at Samsung's top-tier display supplier by phone. Samsung plans to send an official invitation letter to interested parties, media and industry officials for the event "soon." Apple plans to put out a 4.7-inch and a 5.5-inch variant of the iPhone 6 in September, which may sway a few Note users over to Apple, or vice versa. In order to keep its existing Galaxy users and attract more customers, the new Samsung device will have enhanced hardware specifications. "Samsung Note 4 will have far better specifications than the Galaxy S5 smartphone," said Samsung Electro-Mechanics Chief Financial Officer Kwon Young-noh, recently. Samsung Electro is an affiliate of Samsung and supplies camera modules to Samsung Electronics. The new Samsung phablet ― a technology term which means a combination of smartphones and tablets ― will come with a 5.7-inch flat OLED screen and metal frame. Samsung will also bring a curved OLED version of the Note 4 to the exhibition, though the curved Note 4 isn't aimed at appealing to the mass market. "The Note 4 will be the first smartphone to incorporate an ultraviolet sensor. The sensor can measure UV radiation and offer index levels to Note 4 users inside the 'S Health' application," said an executive at Samsung's software partner based in Korea. The upcoming phablet will be powered by Qualcomm processor chips and "definitely" support fourth-generation long-term evolution (LTE) mobile wireless technologies. For users in Korea, Samsung plans to put LTE-Advanced technology in the home-turf, according to the executives. The company made agreements with major wireless carriers in the United States including AT&T, Sprint Nextel, T-Mobile and Verizon Wireless for the guaranteed shipments of the Note 4, while it also plans to hold a big promotional campaign in China. Samsung declined to comment about the date of the event for the Note 4. Officials hope the Note 4 will help the Korean technology heavyweight get fresh momentum to lift its handset business at a time when the company is being threatened by the rise of budget Chinese handset manufacturers. Ever since the Oculus Rift virtual-reality headset arrived, it's been among the hottest topics in the world of gaming. It's a headworn display, which employs a number of sensors and creates the illusion that the wearer is “inside” the game world. Although the display is not the most sophisticated hardware part, it's pretty important in its own, too. The second generation of the curious headwear - Oculus Rift DK 2 (DK stands for Developer Kit) – is already here, but can you ss what smartphone's display got used in the developer kit. iFixit's teardown of the Oculus Rift DK2 reveals that the display of choice in the Oculus Rift DK2 is from... drum roll, please... a Samsung Galaxy Note 3! 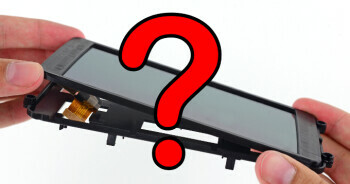 Yes, that's right, it's all there, along with Samsung's logo and even the touchscreen controller module. The 5.7-inch 1080p Super AMOLED is what makes the difference between the real and the virtual world in the latest Oculus rendition. The team behind Oculus has probably decided to do so because using the Samsung-made component will be times cheaper than producing one on its own. It even tweaked it a little – it is said that the Oculus Rift DK2 is toting a low-persistence OLED screen is a 75Hz, which is a tad higher than the Galaxy Note 3's stock refresh rate of 60Hz. Additionally, the true blacks, which are among the highlights of AMOLED displays, will be probably regarded highly by those gamers, who wish to immerse into the virtual reality that Oculus provides them with. Samsung has a new way to market its gigantic phablets — they’re now apparently able to take a bullet for you. 9to5Google points us to a story in Chinese website AppleDaily that describes how a man survived getting shot because the bullet happened to strike his enormous Galaxy Mega 6.3 phablet. Apparently, the shooting victim got into a street altercation with another man after the man dropped his wallet and the soon-to-be-victim picked it up and joked about using it to buy beer. At this point, the man whipped out a gun and fired it straight toward his chest. Luckily for him, however, the Galaxy Mega 6.3 was in his shirt pocket and it blocked the bullet from reaching any of his inner organs. As you can see in the picture below, the phone is pretty much toast even if its owner emerged relatively unscathed. Knowing Samsung as we do, this will probably inspire the company to try its hand at making full body armor that’s equipped with a touch display that you can use on any part of your body. And come to think about it, that would actually be sort of cool. Samsung’s Galaxy Mega 6.3 came out last year and featured a dual-core 1.7GHz processor, Android 4.2 Jelly Bean, a 3,200 mAh battery and an 8-megapixel camera along with a massive 6.3-inch, life-saving display. “To give carriers the ability to do these things, the management tool operates at the highest level of privilege on devices, which means an attacker who accesses and exploits the tool has the same abilities as the carriers,” Wired noted. More details about how the exploit works will be revealed next week. We all know Android’s market share crushes every other mobile platform out there in terms of shipment volume, but Android’s share of mobile usage as recorded by various networks around the world has always lagged Apple’s iOS platform… until now. Just as we noted would be the case, Net Applications shows that Android’s share of global smartphone and tablet usage has narrowly topped worldwide combined usage of iPhones and iPad tablets. This marks the first time in the platform’s history that it finds itself at the top of the mobile pile. Net Applications measure global mobile usage, which it refers to as market share, by monitoring traffic across its massive global network. In the month of July, the firm shows that Android’s usage share jumped to 44.62% from 43.75% in June. As Android was gaining almost a point, iOS’s share of global mobile usage dipped to 44.19% in July from 45.61% in June. The slight loss was enough to move Apple to the No. 2 slot for the first time since Android’s debut, though things could certainly change quickly with the company’s expected iPhone 6 launch just over one month away. Meanwhile, Windows Phone enjoyed a nice boost to 2.49% in July from 1.99% in June, and BlackBerry still isn’t big enough to be counted. 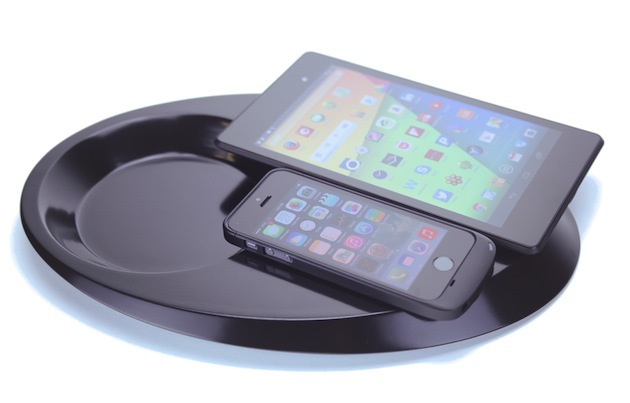 Imagine being able to charge your smartphone battery in just 26 seconds. Actually, this is not imagination. It is reality, thanks to inventor Shawn West, who has developed super fast rechargeable AA, A, C and D sized cells. West is seeking to fund his invention via Kickstarter. On the video that is posted on the site, West says that he will be able to use this technology to develop mobile batteries with the same properties. This obviously could be a game changer. West is seeking $10,000 to fund the project, and thus far he has raised $9141 with 7 days to go. A $25 pledge will earn you a AA battery and a charger, and because of a long shelf life, you can put the cell away in a drawer somewhere,and it will be ready to provide full power when called upon. The initial shipments will take place in October. Unlike other rechargeable batteries that eventually have to be tossed, West claims that his batteries can go through the recharging process thousands of times. If all of what West says is true, it sounds like he has come up with the Holy Grail of batteries. Once smartphone batteries take less than 30 seconds to charge, wallhuggers would become extinct. Microsoft has announced through its official blog that they have filed a legal complaint against Samsung in a U.S. District Court, claiming that the Korean giant has violated a patent-licensing contract which was originally signed in September 2011. As per Microsoft, Samsung had breached the contract when it failed to make a recent royalty payment on time, and also refused to pay interest on its late payment starting September 2013. Microsoft holds patents of certain technologies that are used in Android such as methods for rendering multiple windows in a web browser. Similar to many other Android device manufacturers, Samsung voluntarily entered into this contract with Microsoft to cross-license IP. 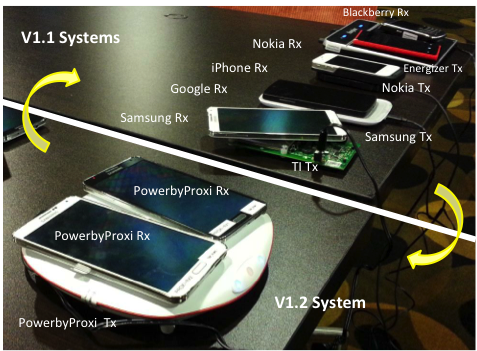 Microsoft states that this patent deal has been extremely beneficial for both parties. As per this deal, Samsung had to pay Microsoft an undisclosed amount for each Android phone and tablet that it sells. Analysts estimated last year that Microsoft collects around $2 billion annually from patent fees on Android devices. David Howard, Corporate Vice President & Deputy General Counsel, has further explained in a blog post that Samsung is using Nokia’s acquisition by Microsoft as an excuse to dodge this contract. With this complaint, Microsoft is asking a judge to clarify that Nokia’s acquisition doesn’t disprove its licensing agreement with Samsung. 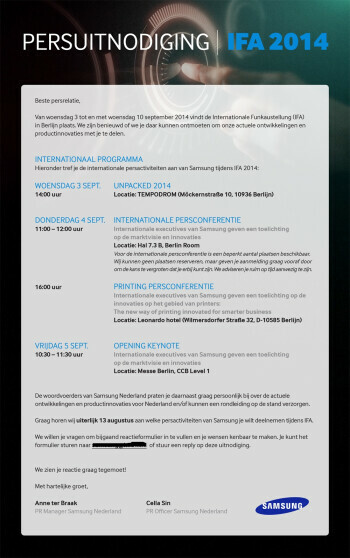 We’re only a month away from the official unveiling of the Galaxy Note 4, and as expected, Samsung has started sending out press invites for the UNPACKED event at the IFA next month in Berlin. As a recent leak had revealed, the UNPACKED event will take place on September 3, and Samsung will take the stage at 2 PM to announce its fourth-generation phablet flagship. If rumors are to be believed, we will see a few wearables, including the Gear VR, get announced as well, and we’ll be live from UNPACKED to bring you all the details on whatever Samsung takes the wraps off on the anticipated day. To refresh your memory, the Galaxy Note 4 is expected to feature a 5.7-inch QHD (2560×1440) display, an Exynos 5433/Snapdragon 805 processor (with record-breaking performance, if leaked benchmarks are to be believed), 3GB of RAM, a 16-megapixel with a Sony IMX240 sensor and optical image stabilization, an ultraviolet sensor, and at least Android 4.4.4 KitKat. A curved screen variant has been rumored quite a few times as well, and it’s only a matter of a few weeks before we find out if that is going to be a reality. We got tipped before that an LG G3 Stylus is on the way, and now LG itself slipped and revealed the largest member in the G3 trio, while making a commercial for the smallest. In the G3 Beat video ad below (that's the "mini" G3 s for China), we can clearly see a G3 Stylus listed at the end, which seems to be larger than both the 5.5" G3, and the 5" G3 Beat. Rumor has it that the G3 stylus will feature the 5.9" display of the G Pro 2, but will be laden with a stylus, and will arrive around the time that the Note 4 gets issued, as a direct competitor. Now, whether this monster will be China-bound, or will see the light of the day in the rest of the world, remains to be seen, but given how LG mimicked the Galaxy line with the trio, the G3 Stylus might very well be outed globally, too. Mum's the word on the rest of the specs, but, given the release timing will be in the second half of the year, it's reasonable to expect a Snapdragon 805 processor to be put inside, but whether or not it will be powering a Quad HD resolution display is anyone's guess at this point.